After I put in the preceding two posts on the Santorini eruption and the relationship to the Biblical Exodus, I discovered that today, August 24, is the 1927th anniversary of the eruption of Vesuvius and the consequent destruction of Pompeii. Here is an interesting article on the dating of this historic event, and here is Wikipedia's article on Pompeii. 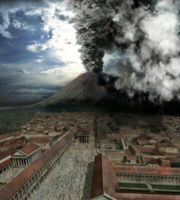 WASHINGTON (AP) In a reliability test of a chemical dating technique, California scientists pinpointed with unprecedented accuracy the date of the Vesuvius volcano eruption that destroyed Pompeii in ancient Rome. Researchers at the University of California, Berkeley, used lava from the Vesuvius explosion, which is known to have occurred in A.D. 79, to validate the accuracy of the widely used radioactive-argon dating system. The results pegged the volcanic eruption at 1,925 years ago, off by just seven years from the date recorded by historians. Other experts said the experiment was an important technical achievement because it was able to accurately establish the age of some of the youngest material ever tested. A report on the research will be published Friday in the journal Science. The Vesuvius eruption suddenly buried Pompeii and some other Roman cities, trapping people in their homes and workplaces. Pompeii has since become one of the most celebrated archaeological digs in the world because it provides such a clear picture of how people lived in the first century. it occurred in the afternoon of what in modern calendars would be Aug. 24, A.D. 79, or 1,918 years ago. With the undisputed accuracy of this date as a target, Renne said his team used the radioactive-argon dating technique on volcanic rock from Pompeii. Renne said the result of 1,925 years has a scientific error range of plus or minus 94 years. ``We nailed the date to 5 percent on our first attempt, so we could probably get the error down to 1 percent or less,'' he said. Dalrymple said the radioactive-argon dating system is already accepted by most scientists as one of the most nearly accurate now in use and the new work hasn't changed that view. The chemical dating system is known as argon-argon dating because it works by measuring the ratio of two isotopes of argon. It is a refinement of the potassium-argon technique. Both systems are based on the fact that chemical isotopes decay over time at a known rate. Potassium-40, for instance, decays to argon-40. By measuring the ratio of the isotopes, it is possible to establish how long ago the sample was melted. Berkeley scientists improved the potassium-argon technique by flooding the sample with neutrons. This converts the potassium-40 to argon-39, an isotope that does not naturally occur. The researchers then measured the ratio of argon-40 to argon-39. Penne said this improves the dating technique because it eliminates errors caused by contamination. The new technique may make it possible to age-date samples as young as 1,000 years, something that has not been possible before, said Penne. Pompei disaster is as famous as Cialis and it's incredible effects against erectile dysfunction... that's for sure !